Posted on January 6, 2018 August 24, 2018 by Bible Students DailyPosted in Hymns of DawnTagged 1 Corinthians 1:26, Aaron, Aaron's sons, all people that on earth do dwell, Bible Students Daily 2018 post, Br. 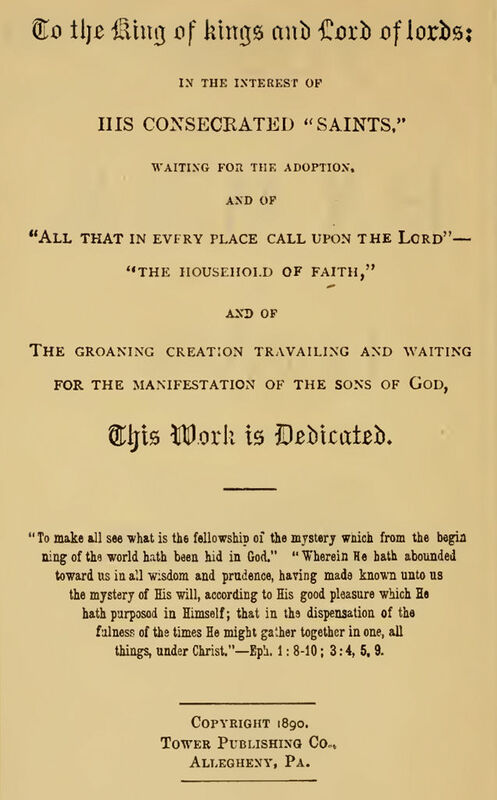 Charles T. Russell, brazen altar, Charles T. Russell, come ye before him and rejoice, consecration, court, divine nature, first resurrectioin, first veil, fully devoted, give thanks, God's steadfast love endures forever, golden candlestick, heavenly light, Him serve with fear, his praise forth tell, history of hymn, holy spirit definition, Hymns of Dawn, hymns of dawn no. 11, incense altar, Israel's Typical Tabernacle, James 2:5, justification, laver, laying down their lives, Levites, lyrics, ministers, Numbers 4:19-20, O! enter then his gates with praise, praise, priests, second veil, servants, shewbread, sing to the Lord with cheerful voice, sufferings, tabernacle, thankfulness, thanksgiving, the Holy, the Lord ye know is God indeed, the Most Holy, tribulation, vail, wise.